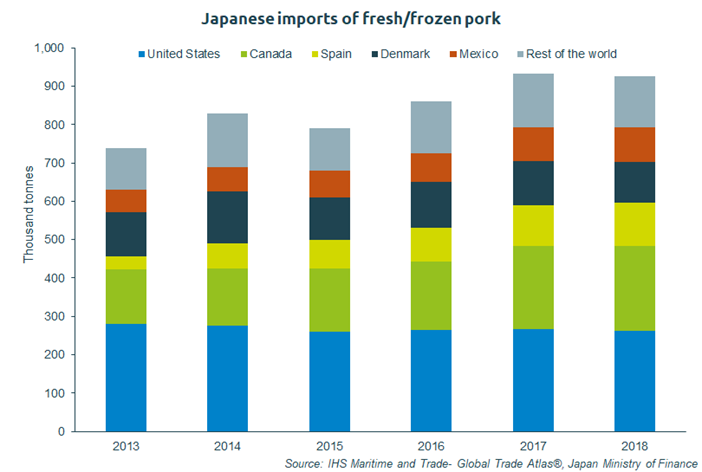 The European Union recently signed a trade agreement with Japan, enabling its members to benefit from lower duties on some pork products, including frozen pork and ground seasoned pork (GSP), from April 2019. Even if the UK does not stand to gain directly after Brexit, increasing the potential of this outlet for European production could bring indirect benefits to UK farmers. It is also the ambition of UK government to replicate as many European Free Trade Agreements as possible. Duncan Wyatt, AHDB Pork’s lead analyst, said: “Japan is a large and important market for pig meat, and is set to remain so in the long term. Japan consumes about 2.5 million tonnes (cwe) of pig meat each year, and only produces about half of this domestically. The OECD is not forecasting growth in demand, so any increase in EU exports would need to be won by taking market share from others. Mr Wyatt said that growing market share will undoubtedly be a challenge, but AHDB’s recent Country Focus Report lends some valuable insight into how UK exports could gain a footing in the Japanese market.